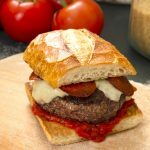 When Burgers are nearly done, add a cup of Mozzarella cheese and Pepperoni slices to each and allow cheese to melt slightly. Take Burgers off heat and transfer pan to oven, and allow to cook under the broiler (on high) for 2-3 minutes or until Pepperoni reaches desired crispiness (don't allow cheese to burn). While Burgers are cooking, heat up pizza sauce in a medium saucepan over medium heat. 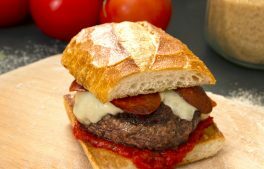 Build your Burger: Ciabatta Roll bottom, Burger with Cheese and Pepperoni, Pizza Sauce, Ciabatta Roll Top. Peel and crush 3 cloves of Garlic. Add 1 TBSP of Extra Virgin Olive Oil to a medium sauce pan or pot over medium-high heat. Add Garlic cloves to hot oil and saute until golden. Do not burn Garlic. Reduce heat to medium-low and add one 8oz can of Tomato Puree. Season with salt and pepper to taste. Allow sauce to cook for 10-20 minutes or until desired doneness. Add 1 TBSP of dried oregano and 2-3 leaves of fresh basil. Sit and remove from heat. Allow sauce to cool slightly before spooning over the Burger.